Representative Honours: Northern Ireland: 3 Full Caps / 1 Goal (1961-1962), 1 B Cap / 1 Goal (1959), 14 Amateur Caps / 11 Goals (1956-1962), 7 Youth Caps; Irish League: 6 Caps/3 Goals (1957-1961); British Universities: 1 Appearance/1 Goal; Great Britain Olympic Team (Rome 1960). Club Honours: (with Coleraine) Gold Cup Winner 1957/58; (with Ballymena United) Ulster Cup Winner 1960/61; (with Linfield) Irish League Champion 1961/62; Irish Cup Winner 1961/62; Ulster Cup Winner 1961/62; City Cup Winner 1961/62; Co. Antrim Shield Winner 1961/62; (with Coventry City) Football League Division Three Champion 1963/64; (with Ely City) Eastern Counties League Runner-Up 1969/70; Cambs Invitation Cup Winner. Being a Ballymena Academy old-boy, Hugh Barr’s schooldays were spent mainly playing rugby, his only chance to play football coming with his Boys’ Brigade team. Although he enjoyed rugby, playing for the school and later returning to the sport when his top-level footballing career had ended, Barr’s one real regret in football was not winning a Schoolboy cap, which would have completed the “set”. After leaving school, Barr’s footballing career started to develop with pace, taking him from Junior side Harryville Amateurs, to ‘B’ Division Ballyclare Comrades, and finally to the Irish League with Cliftonville. At Solitude, Barr won his first representative honours, picking up Youth and Amateur International caps. Whilst attending Loughborough College, Barr was selected for the British Universities team, scoring the only goal of the match against Irish Universities in Dublin. He drew the attentions of Everton, signing Amateur forms in the mid-1950s, but after returning to Northern Ireland to teach at Ballymena Boys Intermediate the travelling became difficult and he signed for Coleraine. At Coleraine, Barr won a Gold Cup winner’s medal and was selected for the Irish League for the first time, scoring on his debut against the League of Ireland in March 1957. 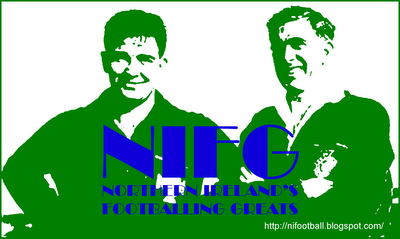 He netted a 60 goals from 99 appearances in his three seasons with the Bannsiders. A move to hometown club Ballymena brought further honours, including a 3-1 Ulster Cup Final win over Glenavon, a match in which he scored from thirty yards out with his left foot – that was one of over 40 goals he scored during the 1960/61 season, including five in an 8-2 Co. Antrim Shield win over Linfield Swifts on 15th March 1961. 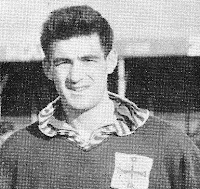 In 1960 Barr was selected for the Great Britain and Northern Ireland Football squad for the Rome Olympics, although he didn’t make the pitch during the Finals tournament. 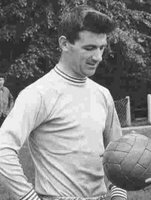 After a remarkable 69 goals from 79 appearances for Ballymena, Barr signed for Linfield in July 1961. Although he spent just one season at Windsor Park, he was an integral part of the side that completed a clean-sweep of seven trophies. Indeed, Barr’s return of 48 goals, including another "fiver" against Coleraine in the City Cup, made him top goalscorer, and even his missed penalty in the League play-off with Portadown could not take away from his starring role in a 3-1 victory. The 1961/62 season also brought Barr his first full international cap, as the Irish put in an excellent performance to draw 1-1 with England at Wembley in November 1961. The following season two further caps came Barr’s way, in a 2-0 win over Poland and in a 3-1 defeat by England at Windsor Park, Barr scoring the consolation. However, it is Barr's Amateur international career which proves more noteworthy. His eleven goals is a joint record with Kevin McGarry, but from one game fewer, and his tally of fourteen appearances was only bettered by three men - McGarry (15), Ernie McCleary (15) and Bertie Fulton (21). At the end of the 1961/62 season, with his pockets heavy with medals, Barr, by then 27 years-old, signed for Coventry City, a club then building for a push which would eventually take them from Third Division to First Division under the stewardship of Jimmy Hill. The 1962/63 season began with Coventry donning a new all sky-blue kit for the first time, with Hugh Barr leading the line. A return of twelve League goals in his first season was not enough to help Coventry out of Division Three, but Barr did score twice in an FA Cup run that took the club to the quarter-finals, where they lost out 3-1 to eventual winners, Manchester United. When the Third Division title was claimed the following season, Barr played only a small part, scoring three goals in thirteen appearances, his refusal to turn full-time due to teaching commitments frustrated Hill and brought his City career to a premature end. Never the most elegant of players, he had always been more of a “battering-ram” leading the line, and when he began to lose his pace, he lost his place in the first eleven. After leaving Highfield Road, Barr played non-League football with Cambridge United. After a brief return to rugby as outside-half with Shelford, Barr took the role of player-manager with Ely City before finally hanging up his boots at the age of 37. Summary: 3/1. Won 1, Drew 1, Lost 1. Summary: 1/1. Won 0, Drew 1, Lost 0. Summary: 14/11. Won 6, Drew 3, Lost 5. Hugh Barr was my Geography teacher at Cottenham Village College in the late 80's! I would just like to correct the height information here. Hugh Barr was 5 foot 10 inches tall, not 5' 5". I enjoyed reading this page. Have just read that a Hugh Barr from Broughshane, passed away at end of AUg this year - anyone know if that is the same Hugh as mentioned above?